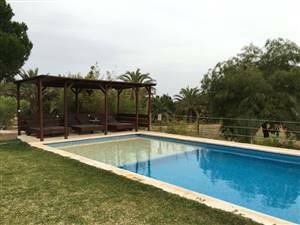 Villa Almendro is a bright and spacious villa, streaming with sunshine! It has a large lounge and conservatory overlooking the garden and pool and is set in extensive private grounds with open and wooded areas. This property provides privacy and tranquility- a great place to truly relax! New chill out area around the pool. Quietly situated in an open valley in the heart of the countryside- and yet just 10 minutes drive to the beautiful beach at Beniras, a 15 minute drive to Ibiza Town or 10 minutes to Santa Eulalia. It is also situated just a couple of km from Cicale, one of the islands most up and coming restaurants with exquisite specialties and superb service. Also close by are La Paloma in San Lorenzo and the well known Bambuddah Grove... And a special bonus... it is within WALKING DISTANCE OF SACCA (approx 700m). This is a stylish luxurious cocktail bar /restaurant with high quality cuisine and DJs playing throughout the season...so if you fancy nights out without the car..
4 bathrooms, one with Jacuzzi! Laundry room with washing machine and iron and ironing board. Spacious fully fitted and well equipped kitchen. Plenty of outdoor space for dining "al fresco". Air con in lounge, fans in all bedrooms. The rental period is flexible. 14.00 on the day of arrival through to 10am on the day of departure.this is necessary to allow for cleaning and preparation the the arrivals. or call us on +44 (0)1227 503631 / +44 (0)7427 685382. Clicking on either of the buttons below will save this Properties details to your computer as a PDF document. Please ensure you have Adobe Acrobat Reader, if you do not, you can get if free from www.adobe.com. The Download Full Brochure button will create a file including all of the properties details.